Many riders try use big front sprocket. I also came to rule: “If you can twist big sprocket, do it”. But as far this is reasonable? It must be marked in development of bicycle transmission a tendency to reduce the q-ty of stars on the pedals. Several years ago, the norm was three, now two, sometimes one. This also reduces the range of the big stars capacity. For example, few years ago the budget bike system (front sprockets) was 42/32/22T and cassette (rear sprockets) 11-32T. Now on a bicycle of the same class system is 38/24T and cassette is 11-36T. 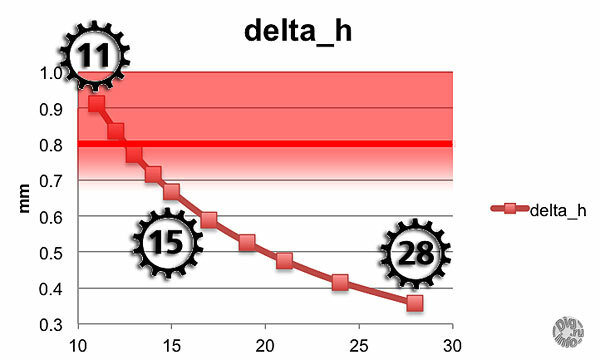 Increasing the small star in the front completely compensated by increase in large sprocket in the cassette (was minimum transmission of 22/32 = 0.69, has become even more high-torque 24/36 = 0.67). But decrease of large star of system can not be compensated in a cassette, as the sprocket less than 11 cogs not used. If to ask Internet, why it is so, the first answer is that very big stars in the system basically is not necessary because it determine only maximum calculated speed which real particular bike did achieve. For example, in the cadence (number of revolutions of the pedals in a minute) 80, on a bike with a wheel diameter of 27.5 inches, maximum transmission 42/11 provides calculated speed of 41 km/h, while 38/11 – 37 km/h. It is too big for mountain bike with typical good cruising speed is 30 km/h. That is, if you go 28-29 km/h at 80 cadence you can not see difference between gears 42/16 or 38/14 as all this is far from limit of cogs. In my experience, I can not agree with the first answer. In my particular bike, even in the forest transmission 42/11 is used very often. There are other cases, in addition to achieve of hypothetical maximum speed on an ideal surface. But most importantly, I can not agree with the second answer. Big star on the front turn better. That is, if you want, for example, go up the hill at a speed of 14-15 km/h, it can be done on any of the three stars of the front, corresponding ratio is 42/24, 32/18, 22/12. And here, in practice, it is very noticeable that all these gears are different. And the best pedalling is just on big star, 42/24. In this gear is much higher “elasticity” – overcome of small changes in speed, more smooth pedalling and easier acceleration if needed. It is understood that most of these sensations may be only in the head. Digging the Internet has shown that not only in my head. Cycling wisdom full of sayings such as “big ring is king”. No one saying that all the stars are the same, and most importantly the correct choice of transmission. 1. Why it is better not to use a small sprocket in system. In this section it will be shown that the stars 11, 12, 13 essentially worse than the others. Therefore, if the use of the big stars in the front allows you to not work on the rear stars 11,12,13, it gives visible results. Chain transmission correspond to rotation of polygons, the more teeth, the closer polygon to a circle. At Fig. 1 red color shows the polygon that forms a chain on 11 cogs star. Rollers of chain are vertices of the polygon. Photo captured in position when working link (the link for which the chain rotates the cassette) in parallel to chain. By turning on the “half tooth”, when roller is in the yellow dot, chain rises. When turn another half a tooth chain falls again and the situation will again as in the photo. Thus the chain beating occurs. This is feature of rotating polygons, there’s nothing about it 🙂 The bigger sprocket (more number of teeth), the lower the amplitude of the beating of chain. By the way, in engineering calculations of sprocket gears is not recommended to take the number of cogs less than 13. In cycling the situation is worse because the teeth “rasped” so that the chain could move from sprocket to sprocket. For this move rollers of chain need to climb only to 0.4 mm. And the bottom of sprocket cog is about 0.4 mm deeper than polygon determine. In general, the amplitude of the beating chain must be compared with the maximum possible movement of the roller to the exit from tooth. If the beating is greater 0.4+0.4 mm it may be difficult to cling to the teeth. Here’s a graph of the amplitude of the beat with a marked boundary. It is evident that on the stars 11, 12, 13T gearing is not reliable. 14T is also better not to use. If teeth are not rasped (bikes with one gear), you can normally use 11T or less. But in cycling with gears not. 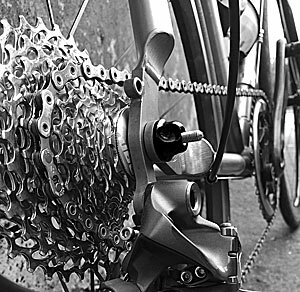 So if the big stars in the front allows you not to use sprockets of cassette 11-14T it will give a distinct advantage. 2. Big stars and hard uphill. Engineering calculations give a dependence of chain tensile force on diameter of driver sprocket. The larger diameter (i.e. number of teeth of front sprocket), the less tension. Because the above-mentioned article of 1998 not shows much of a difference in the choice of stars, it means that the working tension of the chain does not lead to changes in the efficiency while uniform pedaling. But man is not the engine, man pedaling evenly. Moreover, advantage of big front star was noticeable under the powerful pedaling uphill. That is, you need to understand how work tension of the chain in acceleration, i.e. speed variation. More close is to starting of rotation when there is almost no speed while acceleration is. That is, it need to apply force to pedals, and look when the bike will move. Then compare the results on similar ratios, but received on different front stars. I did not find relevant engineering calculations of power transmission when starting a chain drive. Fortunately, such experiment is easier to do than to delve into the theory. Figure shows measured force applied to the pedal to turn braked rear wheel. The chain was on the front sprocket 50T. For start rotation of partly braked rear wheel it was need to make an effort 3.5 kg when the chain was the star 28T of cassette and 9 kg, respectively, when the chain was on star 11T of cassette. A series of three measurements (1,2,3) were done. The data is better represented as a starting force dependence of transmission ratio. Thus, for the star 50T it obtained a linear dependence of of the starting force on transmission (ratio of front and rear stars). Now it need to compare these lines for all three chainrings and see the difference in the breakaway force on the same gear. If a big star “break” more easily, the line “50T” should be below the “39T” and the line “30T” should be uppermost. Alas, the miracle did not happen. All three front sprockets show linear perfect transmission. Thus when force pedalling at super low cadence there is no any difference which front sprocket is in use. 3. Big stars and jerking of sprocket transmission. It so happened that just finished above measuring I’ve changed big front sprocket on road bike to new star 53T instead of 50T, because at the last brevet I used too often the smallest stars in cassette. And we went to ride to our the standard route on the 83 km. Miracles did not expected, but was listening to the sensations. Pedalling still clearly better. But if it’s not in the amount of efforts, then what? Clearly smoother pedaling. And in the middle stars in the cassette, i.e. regardless of consideration beats the chain in the first section of note. Chain drive, as built on rotating polygons, transmits the rotation with jerks. It is described in this section. Returning to Fig. 1. Chain is photographed at the point where the force with which the roller pulls the sprocket tooth is not directed at a tangent to the circle of rotation. So force that spins the star is less than the force with which the chain pulls the roller. At yellow dot chain coincides with a tangent to a circle, so a force is fully transmitted to the chain sprocket rotation. This leads to a jerky rotation of the sprocket and hence the rotation of the wheel of bicycle. It should be felt on the pedals as “not smooth”. The similar jerks there are on the front stars. The amplitude of the jerks on the star 11T is 4% of the total force. On the star 30T – 0.5%. It is unlikely that it is possible to feel the jerk on one tooth. Rather, the several number of jerks will be felt, for example, in one revolution of the pedals. The first estimation immediately gives a good graph that corresponds to the sensations. That is when you can select transmission by different combination of stars, at small front star ride will be the more “ragged”. In other words, in one revolution of the pedals when the chain is on the star 50T of system we can feel by foot 50 small jerks from the front star and 50 harder jerks from rear star. If to choose the same ratio with the front star 39T, we get per rotation of pedals 39 jerks from the leading star, each slightly larger than that of 50T and 39 jerks from the rear star, smaller than in the previous case, and jerks of it will be much more. 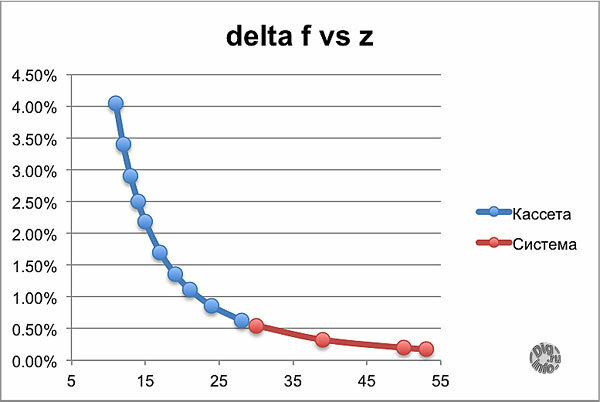 The sum of the multiply of number of jerks to their amplitude in the second case will be considerably larger, for example for the gear of 2.5 to 30% (the value of Y on the graph is 1.0 vs 0.75). How is it arranged these jerks? 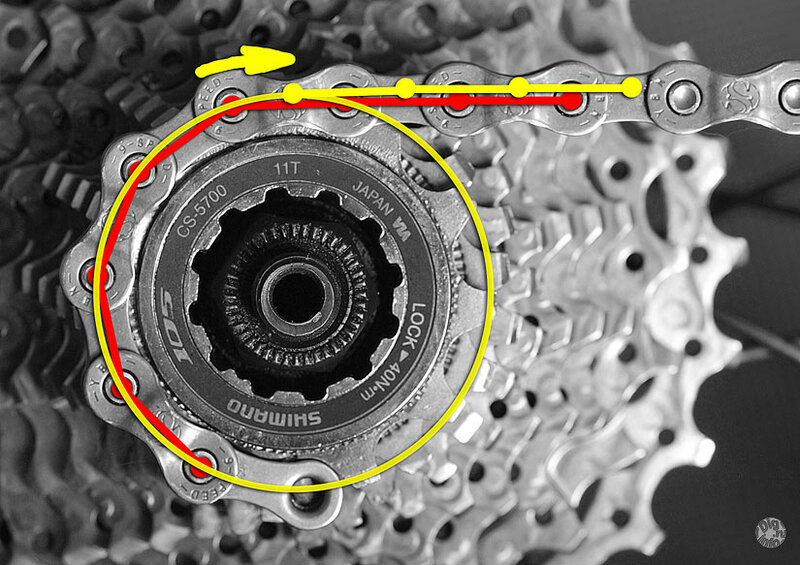 Consider rotation to amount of “one tooth” of sprocket 11T and for comparing the same angle for sprocket 28T. 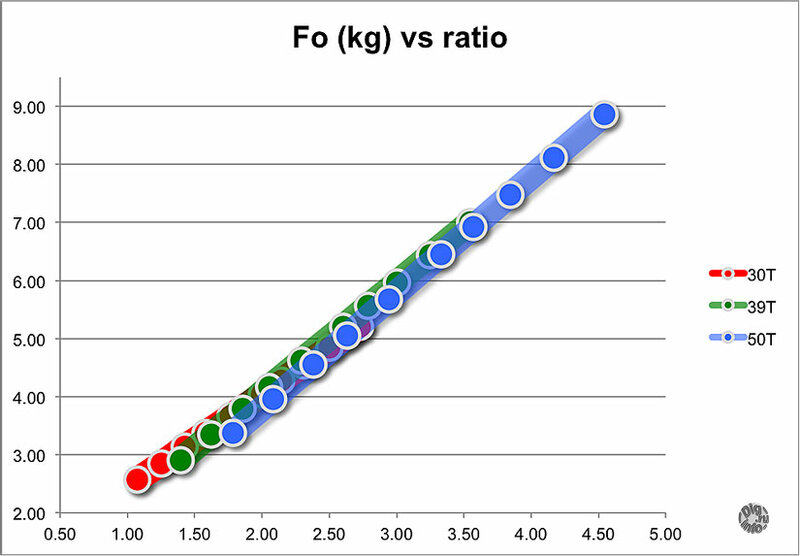 Let’s start from the point of maximum pulling force of chain (yellow dot in Fig. 1). The strength of the rotation is equal to the force pulling the chain, so coefficient of transfer of force = 1. Then, this force smoothly decreases. When working chain link on the sprocket becomes parallel to the chain (as in the photo), a change of pulling roller is occurred. Previous joint comes off the sprocket, starts the next. 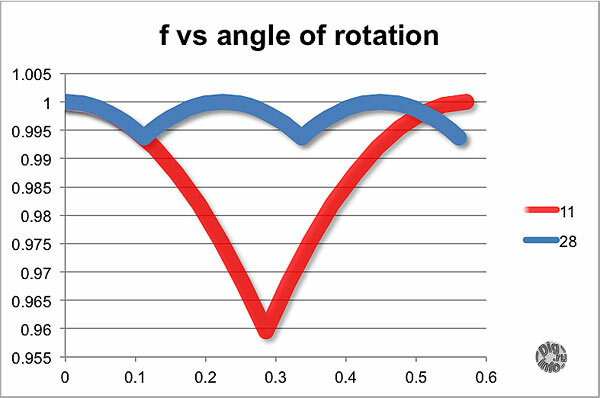 The graph that corresponds to that angle of rotation of the sprocket sharply break changes of the rotating force. After that there is a smooth increase of rotation force. I think that jerks is just correspond to this break. If compare the graphics to 11T and 28T of stars, one can see that in addition to the large amplitude of the leap of star 11T this breakthrough is also more sharp. If to enter any inertia in the rotation, as it takes place on a real bike, it smooth the graph. This small fractures will disappear while large still remain, so the difference in jerks will be more. Therefore, we need to include to consideration not only amplitude of jerks as above but also degree of “fracture”. 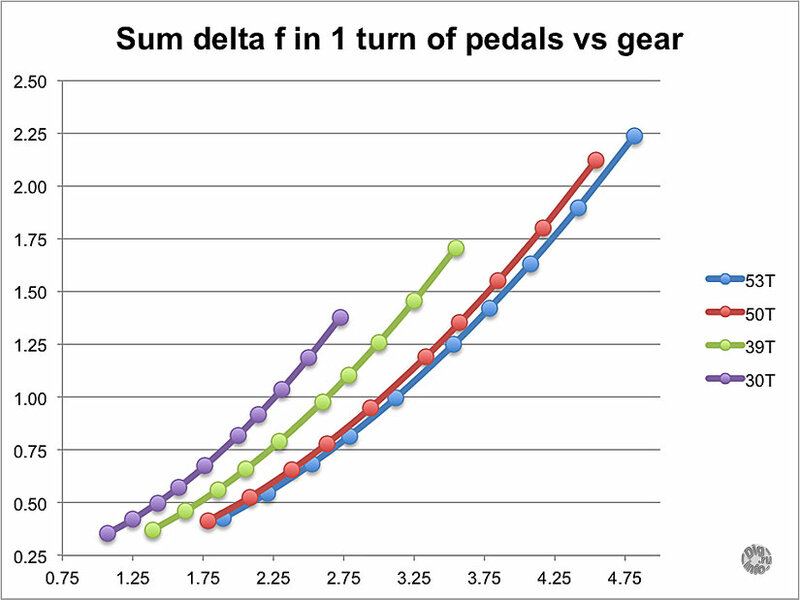 It’s also good for calculate and total dependence of jerks on one turn of the pedals on selected gear even more beautiful (even without taking into account the inertia, that is, only the “naked” geometry). 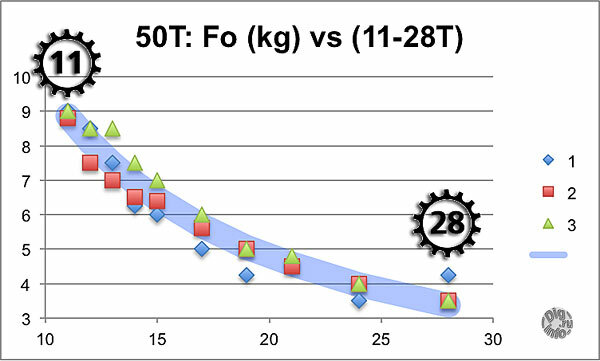 We see that, for example, for transmission 2.5 smooth of transfer the forces from the foot to the wheels is two times better with the big star 50 or 53T than 39T and 39T is almost two times better than 30T. 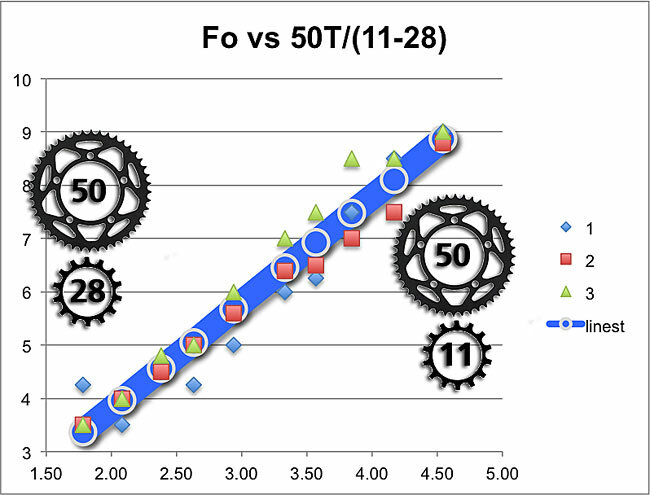 Moreover, it is really noticeable difference between 53T and 50T in the middle stars of the cassette. It is 10-15%. The effect of jerks efforts seem more noticeable at low rotation speeds, high cadence much more involve inertia of all rotating elements, which should decrease the jerks. That is, jerks it noticeable more on power pedaling with low cadence. Summing up the three sections have to state the following. 1. It should be avoided work on small stars (11-13T) of cassette, especially at high speeds. The chain will hammer on the teeth up to overshoot. 2. 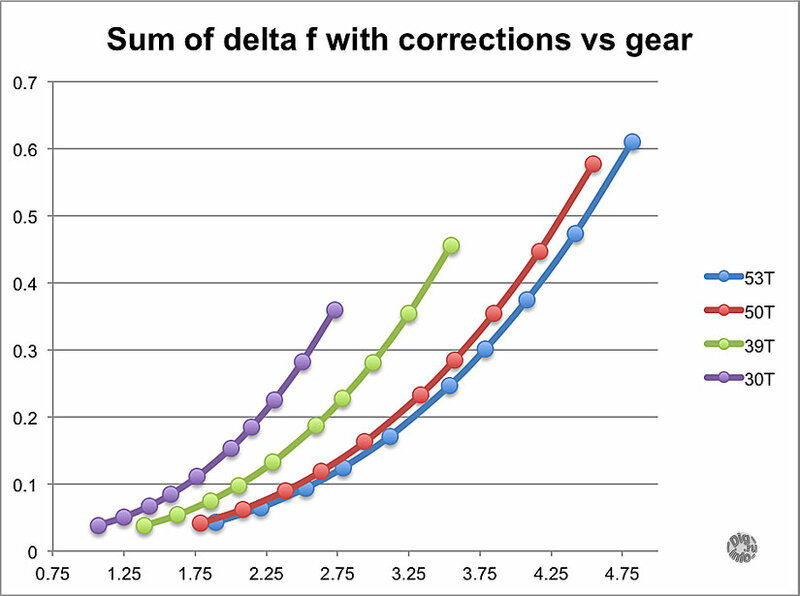 When starting and acceleration at the beginning it does not matter how to select gear ratio on any stars. In this case the preference for better use of large stars on the front or small one is only in head. 4. In increase of the inertia of torque elements (heavier wheels, or increase of speed) dependence on the choice of leading stars getting smaller. Really nice article. Thank you very much. 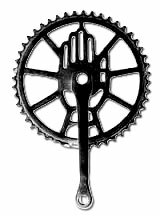 1) “smothness of the pedaling” does not coresponds only on with the size of the cogs, but likewise on the size of wheel (tire) itself – on size/diameter of wheel depends what absolute part of perimeter of the tire coresponds with the angle/sector given by one tooth of the rear cog/sprocket. 4) (on single speed bicycle) to have the wear/running-in (of the chain) uniform, the number of tooths of the pinion/sprocket should be odd number and optimally even prime-number. Thank You for reasonable additions! Next Next post: Optimal cadence. Yes or no?